Trouble comes in three’s; and so does good stuff. Sometimes. And I had one of those good times on a recent Saturday when I watched three movies: The Post, The Disaster Artist, and Molly’s Game. This is the “award season” and the studios are providing screener DVD’s to film critics to promote their movies. This is a fun time for members of the Houston Film Critics Society as the movies are rolling in daily via mail, UPS, and FedEx. 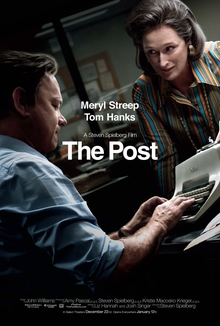 Two of these three movies are based on “true stories” – “The Post” starring Meryl Streep and Tom Hanks as the publisher and editor of the famous Washington newspaper during the Nixon years when there was a major legal battle forcing the possibly illegal decision to publish or not to publish the infamous Pentagon Papers. The second film based on a true story was about a young Olympic-Class skier who was hurt in a career-ending accident and struggling financially who took the unusual career choice of running a high-stakes poker game. What beautiful young woman wouldn’t want to host a fifty thousand dollar buy-in game of cards. Texas Hold Em, and let the chips and craziness fall. Jessica Chastain is on my short list for Best Actress for her portrayal of Molly Bloom. And did I mention that “The Post” was directed by Steven “Jaws” Spielberg. I refer to the shark movie because much of Spielberg’s genius in creating the exciting drama and crescendo suspense of the near-perfect “Jaws” is also very much part of the superb script and a compelling mix of a wonderful cast that includes Bob “Better Call Saul” Odenkirk as a investigative reporter. “Molly’s Game” was directed and written by Aaron “West Wing” Sorkin and his fast-paced dialogue and clever repartee between characters is alive and well in this fascinating story about Sweet Molly playing with the big boys. Idris Elba is Molly’s lawyer, and we are, once again, reminded that Elba is not lucky; he’s good. And then there’s “The Disaster Artist” directed by James Franco. There are some movies that cannot be accurately described in print; you just gotta see it to believe it. Franco stars as a budding actor who has an apparent heavy Eastern European accent who claims he’s from New Orleans. Director Franco also produced this movie with others including Seth Rogen so he had the power to hire his real-life younger brother, Dave Franco, to play the lead. I like a little nepotism. Franco (James) dominates the movie, circa 1998, as a long-haired (think hippie) bizarre mystery man who lives in a one bedroom apartment with a roommate (Dave Franco) yet he has the wherewithal to finance the making of a fully-staffed Hollywood film. Is the film within the film a disaster? Go see this delightfully original movie and decide for yourself. The experience of watching these three outstanding films in a span of about eight hours was a Red Letter Day for this film critic. I sit through enough clunkers to be grateful when the gems arrive. Rock ‘n Roll. The Post – 92 The Disaster Artist – 92 Molly’s Game – 92. 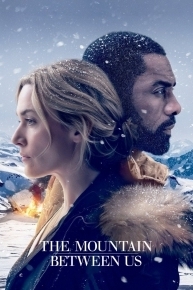 This is a pretty movie; the shots of the Rocky Mountains are the constant backdrop for our two heroes who must survive after their small plane on the way to Denver crashes somewhere on a snow-covered peak; nobody knows where the plane went down. The only other person on the plane was the pilot (Beau Bridges) and he failed to file a flight plan. Darn the luck. Elba is a troubled neurosurgeon and Winslet is a professional photographer. 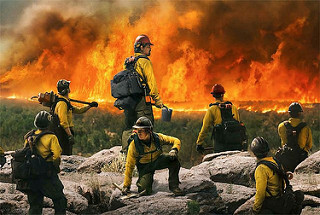 Fate has thrown them together; they were not buds prior to the crash so Israeli Director Hany Abu-Assad must build the characters while telling this tragic story of survival without boring the audience who has seen many movies very close to this plot. What’s different about this Mountain? Elba and Winslet. They are super-talented based on their body of work and they appeared to take their roles seriously as surely they knew that this was a unique opportunity to shine when it was snowing because the camera was on one or the other or both for almost two hours. We all know Winslet has won an Oscar for her performance as Rose in “Titanic” in 1997 when she was only 22 years old. Wrong Academy Award Breath, she was nominated, but she won her only Oscar as Hanna Schmitz in “The Reader.” (2008) Speaking of older folks, many of you will be pleased to see a conversation between Ben and Alex about the wedding scene in “The Graduate” (1967). Idris Elba, from London age 45, not only has one of the coolest names in Hollywood, but he has become an accomplished and handsome leading man with a golden silky voice. In this movie, the race card is not played even though the main characters are an intelligent black man and a skilled white woman. What does that mean? I don’t know. This movie has had mild success, but you’ll see it sometime; might be on Showtime on a Friday night, but these two actors are worthy of the price of a ticket and absolutely can carry a movie if the director will get out of the way and let them perform. This is not an inventive screenplay, but the chemistry between Elba and Winslet is explosive and memorable. Rock ‘n Roll. And some of the other character names are: Man, Woman, Younger Brother, Oldest Son, Philanderer, Bumbler, and my favorite – Fool. 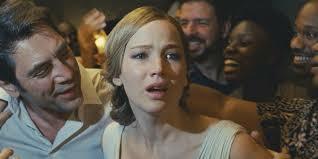 Oh, I forgot to include Mother played by the super-talented, Oscar-winner Jennifer Lawrence. Please don’t blame J Law for this debacle. Who should we blame, Larry H? Darron “I’ve Also Directed The Wrestler (2008) and Black Swan (2010) And I Know A Thing Or Two About Movies So Trust Me On This One” Aronofsky. He wrote this bizarre screenplay and then directed an all-star cast who apparently bought in on the premise that his inexplicably weird tale of family - ten steps beyond dysfunction and believability would be entertaining at a level justifying the star power of Lawrence, Bardem, Ed Harris, and Michelle Pfeiffer. The acting was not a problem. The failure to deliver any semblance of resolution and vision for the ticket-buying public was the problem. I waited the entire movie for the payoff. No payoff. If there was a payoff, it was under the Hollywood table because I sure as heck didn’t see it on the screen. Aronofsky smoked one too many doobies and before he came down, he attempted to capture his hallucination and trick me into buying a ticket to see four of the outstanding actors currently in Hollywood perform scene after scene that were meaningless and without entertainment value. While I agree, there are a few memorable vignettes in this mindless stream of Aronofsky’s unconsciousness, the overall package was damaged goods. Thanks goodness the popcorn was good. Rock ‘n Roll. It is the responsibility of the director of a movie to set the tone early in order to establish the theme and message of the film. Most good directors can hook an audience with opening scenes and then successfully build solid character development and then bring it home in the third act. We all know how it works and so does director/co-writer Destin Daniel Cretton which meant that after 45 minutes of watching this film, I was convinced that the melody and texture of “The Glass Castle” was set in stone and there was no hope that I could possibly like this movie. 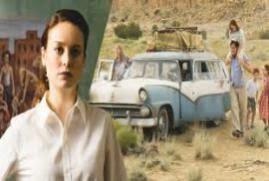 The movie is based on the memoir by Jeannette Walls, born in 1960, who shares the story of her own dysfunctional family who travelled by car with all of the worldly possessions from one shack to the next dump without running water and electricity. The father played by Woody Harrelson is in full denial of his drinking problem and Mamma Walls, portrayed by Naomi Watts is a flighty artist who is the classic enabler while she ignores the needs of her small children. And the definition of fun by slapping and belittling young children in the Walls Family was pure, unadulterated child abuse and Director Destin Daniel, gotta admit that’s a pretty cool name, passed it off as charming and a healthy part of life experiences. I have not read Walls book and I’m sure there is some sort of happy ending as she grows up to become a successful journalist, but this movie was offensive in its subtle depiction of physical and mental abuse of the Walls children. After 45 minutes of almost zero humor and endearment, I decided that I would not participate in this sorry excuse of a movie and I bounced. I know that life is difficult but you don’t have to use children to make that point when in fact the adults were mean and unkind hidden in the good looks and charisma of Harrelson and Watts. I hate this movie and will not read the book. But here’s some good news; there’s always next week’s movie – “Lucky Logan” starring Channing Tatum and Adam Driver and “The Hitman’s Bodyguard” with Samuel L. Jackson and Ryan Reynolds. Rock ‘n Roll. If you are a fan of Stephen King and can’t wait until his next book comes out, AND you’ve read all eight of his books in the Dark Tower series, then this movie is for you. Otherwise go see “Kidnap” starring Halle Berry. I’ve seen “Detroit;” it’s an excellent movie about race in the 60’s so you might consider it. “The Dark Tower” is typical of the fertile imagination of Crazy King. It’s billed as an eternal fight between Roland Deschain, The Gunslinger played by Idris Elba, and Walter O’Dim portrayed by our very own Matthew McConaughey. And that’s how I got tricked into seeing this film. Elba has done some outstanding work lately for the Marvel Cinematic Universe as Heimdall and, of course, I’ve bought into the whole Matthew McConaughey shtick – Alright, Alright, Alright. King and Director Nikolaj Acrecl, from Copenhagen Denmark, made sure that the audience was on a journey of Good versus Evil. And guess who was evil? Hint: McConaughey was dressed in all black with jet black hair that stood on end and it seemed very hot at his house. And Elba mentored a young boy and carried two Remington 1858 Revolvers and could shoot faster than John Wayne. Oh yeah, The Last Gunslinger also wore a really cool duster and authentic cowboy boots. It seems that The Dark Tower is considered the center of Crazy King’s universe which gets its power from six beams and are, in effect, twelve spokes; blah, blah, blah. 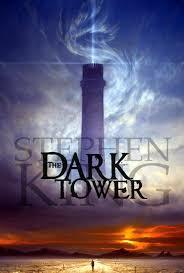 I’ve read a few books by Stephen King, but none of The Dark Tower series that was first published in 1982. Rumor mill is that this movie has taken ten years to make it to the big screen. That rumor came to me via one of my audience members who was a twenty-something woman wearing a Billy Joel Touring shirt and desperately wanted to talk about the movie as we were walking out of Theatre #5. I’m a friendly guy so I responded by asking “… what did you think of the movie?” And this sweet young Kingite gushed “oh, I loved it; didn’t you?” “Yes ma’am,” he said with Boy Scout enthusiasm. Back to the movie: It’s important to understand that Tom Taylor (the big winner), age about 12, plays Jake Chambers, the boy who has special powers and “the shine.” Jake and The Gunslinger travel together and are looking for a portal. Who among us is not looking for a portal? Anyway, Jake lives in a Manhattan apartment with his mother and unloving stepfather, but he escapes attempts to place him a looney bin and ends up in another dimension helping The Last Gunslinger fight his nemesis. Okay by me. Stephen King is one of the most successful writers of our time and has sold approximately 350 million copies of his books which have been made into many movies. Rock ‘n Roll. Director/Writer Christopher Nolan has made his mark with “Dunkirk.” His work on “The Dark Knight,” “Man of Steel” and others such as “Prestige” put him on the Hollywood map, but this stupendous piece of movie-making will reserve a seat for him at the Big Boys Table for creative thinking and mastery of the craft. This film is a story about British and French soldiers trapped on the beach at Dunkirk in 1940 and the Germans are closing in fast while enemy planes are bombarding men packed onto ships with no cover who are “sitting ducks.” And the seemingly helpless warriors are attempting to hold on while praying for relief which would be a miracle. Nolan had a $150 million budget, but he used every nickel on the construction of magnificent sets and thrilling action that dropped the battlefield into the laps of the audience. I felt like I was in this fight and I was scared of the shooting, bombing, and drowning. This battle was too one-sided and unfair. Whoever said “War is Hell” knew about Dunkirk. The dialogue is minimal and the character development is just enough to allow the viewer to choose sides and understand the courage, desperation, and the anxiety of hopelessness. When I say that the “dialogue is minimal;” that’s an understatement. That is part of Nolan’s genius for this movie, and he took a huge directorial leap of faith by allowing this film to speak through the action on the screen; not the explanations or narration by his characters. The movie is all about the action and the emotions of warfare so the actors don’t really have a great opportunity to shine. But, big props to the revered stage-actor Mark Rylance as the British civilian who steps into the war. He probably will not get any nominations for this performance, but I was riveted by his portrayal of the captain of a small “family yacht” sailing toward Dunkirk. Reminder: Rylance won an Oscar for Best Supporting Actor when he shared the screen with Tom Hanks in “Bridge of Spies” in 2015. Since the Battle of Dunkirk occurred before the Americans entered WWII, it does not have the historical flair or reputation of post 1941. Nolan, however, being the Brit that he is, clearly understands the grit and greatness that occurred on those beaches. Rock ‘n Roll. 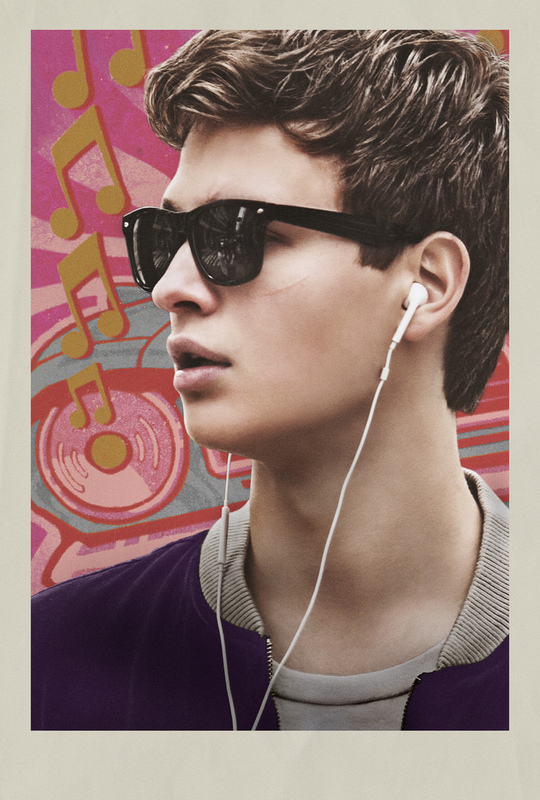 This is Ansel Elgort’s coming out party. He’s only 23, but he is THE star as “Baby” of this movie which is blessed with other big names like Kevin “House of Cards” Spacey, Jon “Mad Men” Hamm, Jon “Walking Dead” Bernthal, and Jamie “Oscar Winner” Foxx. And here’s some of the names of the characters who make up the bank-robbing gang led by Doc: Buddy, Bats, Eddie No-Nose, JD, Griff, and Darling. And the super-skilled, tire-burning getaway driver is named Baby who perpetually wears dark sunglasses and ear buds so he can listen to music while Doc is explaining the details of the next big heist. And this entertaining and amusing band of charming hoodlums is the product of writer/director Edgar Wright’s fertile imagination. Wright at 43, has already reach enough success to convince these big-dog actors to play along in his Taratinoesque light-hearted car chase and bang-bang film with lots of blood and complicated good guys who kill people without regret. “Shaun of the Dead” in 2004 is probably Wright’s biggest jewel prior to “Baby Driver” but this cleverly-scripted movie and box office success will open many financial doors for this Brit. He and Ansel Elgort will forever be merged in their careers as this movie might reach cult level. Elgort’s classic good looks and pleasant smile will serve this talented actor well as he will continue to get hunky parts for the lead male who isn’t afraid to show his emotions. The love story in this movie (of course Wright injected the forbidden love of two young, bright-eyed and misguided twenty-somethings) blossomed in the midst of a cops and robbers farce filled with automatic weapons and intrigue. Biggest winner other than Wright and Elgort: Lily James as Debora the waitress who falls in love with Baby. For those of you keeping score, she was Lady Rose MacClare on “Downton Abbey.” And yes, Lily James was born in England in 1989. “Baby Driver” has had some big buzz and anticipation; my film-critic friend Travis L. thinks “it’s the best movie of the year; so far.” I wouldn’t go that far, but this flick is enjoyable and ingenious. Bravo Edgar Wright! Rock ‘n Roll. Excellent script by Gregg Hurwitz and direction by Colin Trevorrow was on the mark and kid-friendly because his young stars performed like seasoned adults when needed. The family in this movie is anchored by eleven-year-old Henry who has the intelligence of an Einstein and the maturity of… (awkward pause) I’m sorry I can’t think of anyone that I know who is mature. But you get the point. Henry Carpenter went to a regular school because his mom (Naomi Watts) wanted him to develop some healthy age-appropriate social skills. Watts’ character, the single mom, played video games and left the financial decisions to Henry. Another wise decision by the waitress-mother who deeply loved Henry and his younger brother, Peter. Henry made stock trades on a pay phone apparently because he was too young to have a cell phone. Strange family. But, they are loveable and the character development was fantastic. And that is the key to any movie. I understood and liked these characters so I knew that Director Trevorrow was setting me up for the punch in the gut. And if one is trying to embellish, a Hitchcockian suspense and twist. There’s not a dull moment in this low-budget film about love, devotion, and doing the next right thing. Estimated $10 million which is extremely low by Little Tom Cruise’s standards, but his “The Mummy” laid an egg for $125 million. So who’s counting? Not me; these simple sets, haunting music, thoughtful costumes, and zero special effects make this film distinctive and evocative. 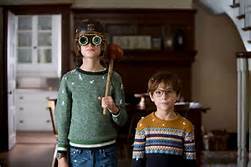 Big winners: everyone in the film and/or connected to it in any manner; “The Book of Henry” is a huge victor worthy of much acclaim and gold. Great movies invariably have great casts and this is no exception. Biggest surprise – Sarah Silverman in low-cut blouses, heavy make-up and a drink in her hand. Jaeden Lieberher, 14, as Henry, has carved out an acting career for himself as the multi-layered boy-genius who portrayed kindness, insight, and compassion. Dean “Breaking Bad” Norris is the stern cop living next door to the Carpenters and Lee “Halt and Catch Fire” Pace plays a brain surgeon who will make a house call under the right circumstances. Target audience: teenage girls based on my audience. And I heard all of them sniffling and shuffling when things got emotionally tender. 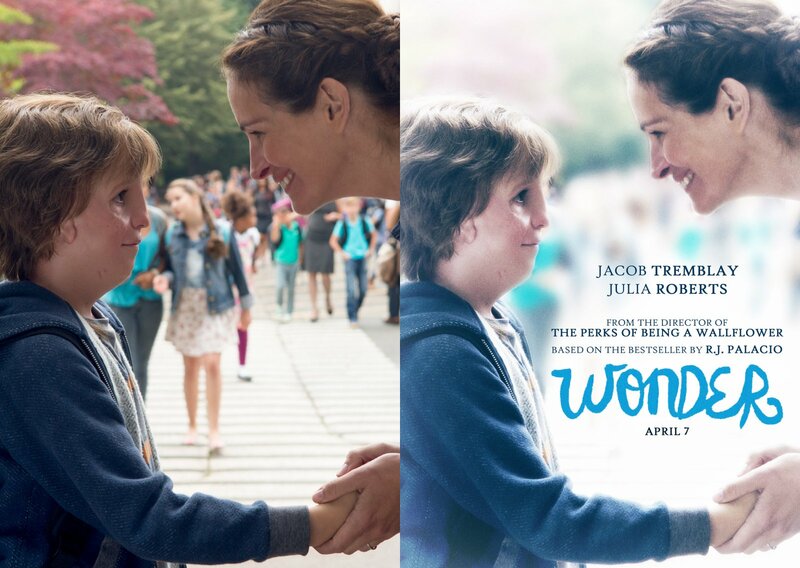 This flick is high on the “Heart Strings” scale. Take a hanky and have fun. Rock ‘n Roll.